These swords are well-balanced and easy to use, and can deal a lot of damage. To see the other types of swords, click here. Lightning Bruiser: Level them up until they reach Toku, and they will gain notable boost in mobility. Even more so if they have horses equipped. Mighty Glacier: While not as extreme as oodachi, they start out with limited mobility. However, see Lightning Bruiser. "Mikazuki Munechika. They call me Mikazuki on account of the many patterns on my blade. Please take care of me." A Tachi from the Heian Period and one of the Five Great Swords of Japan that is said to be the most beautiful. Infamous for having the highest rarity in-game when the game was first launched, until Juzumaru was introduced. In the game, he's rather laid-back and generally friendly to the players. In the fandom, most of the time he'll be depicted as a typical old man. 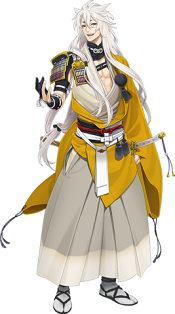 Mikazuki Munechika is a main character in Katsugeki/Touken Ranbu. He is also a main character in the stage plays and musicals, as well as the main focus character for the first live action movie of the franchise. Badass Grandpa: He doesn't look like a grandpa, but he calls himself one due to how old he is (he was made in the 11th century) and he can still hold his own in a battle. Back-to-Back Badasses: Most prominently with Tsurumaru Kuninaga in several of the adaptations. Bash Brothers: With Tsurumaru Kuninaga and Yamanbagiri Kunihiro in several of the adaptations. Break Out Character: Is undoubtably one of the most popular and iconic characters in the entire franchise, with even Word of God agreeing. He is one of the only characters to consistently appear in every adaptation of the franchise created note Save for the few musicals with a different focus group filling a big role in them. He was promoted to Series Mascot alongside Konnosuke because of this and to this day is still considered one of the most sought after characters in the game. Casual Danger Dialogue: Even when getting heavily damaged, he'll still be laughing (although later he does point out that it's not the time to be laughing)! Catch-Phrase: While he had only used it once during the loading screen in Touken Ranbu, the other adaptations have taken to making "Brilliant, Brilliant " note " よきかな, よきかな " or " yokikana, yokikana " the character's coined phrase. Cloudcuckoolander: His extremely laid-back nature makes him come across as this at times. The official manga spinoff makes this his most prominent trait. This is also carried over into the adaptations, but especially flanderized in The Musical. Dirty Old Man: Implied to be this in the game given some of his lines... Parts of the fandom tend to play this up depending on the story though it rarely comes up in the adaptations which focus on his other more eccentric traits. Exotic Eye Designs: His irises have a gold crescent-moon design right under his pupils. Glowing Eyes: In various official works, his eyes are shown to glow either goldnote As displayed in Hanamaru, though the crescents in his eyes are shown to glow gold as well in Katsugeki or a vibrant blue note As displayed in some official art depicting the character as well as in Katsugeki when he delivers a No-Holds-Barred Beatdown to the enemy Oodachi.. Guest Fighter: Appears as a playable character in the Granblue Fantasy x Katsugeki/Touken Ranbu Crossover event alongside Izuminokami Kanesada and Yamanbagiri Kunihiro. 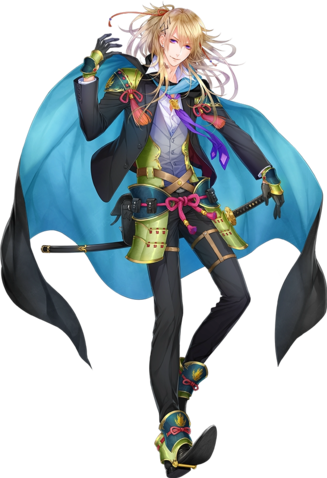 His being the highest rarity is carried over into that game as well, as he appeared as the first event SSR character in that game, mirroring the fact that he was the first 5 petal rarity sword in Touken Ranbu. Hair Decorations: A tasselled headband. "Groundhog Day" Loop: Is revealed to be trapped in one in the Stage Play adaptation where only he knows what's going to happen across each loop. Hidden Depths: He's mostly a laid-back guy with a knack for teasing lines. Still, for someone who says he does not mind losing, he openly laughs when given the MVP title, and holds back on complimenting his sparring partners with anything better than "so-so", while other swords usually commend their partners or talk about how they still have much to improve themselves. This suggests he might be a bit more competitive than he's willing to show. His kiwame send-off line is also a tad harsher than one would expect: Mikazuki calmly comments that he hopes the traveling character comes back, but if they die on the way (the words he uses can be literally translated to "die a miserable death"), it's the end for them. Note that he's likely to be speaking of a child-like character, considering that Tantou's are potential candidates for Kiwame training in your citadel. On another note, its demonstrated in several of the adaptations that Mikazuki's CloudCuckooLander tendencies are a front and he's much more competent and knowledgeable than he leads others to believe.. Despite often being shown to be a proficient fighter in the adaptations, hes also shown to be either lazy or intentionally ditzy until the situation calls for him to act. Iconic Item: His tasselled headband. In-Series Nickname: Calls himself and is also called by others Jiji which means Gramps. Japanese Honorifics: Is referred to as " Mikazuki-dono " by Kogitsunemaru and Juzumaru Tsunetsugu. Lightning Bruiser: Moves at incredibly fast speeds when fighting the enemy Oodachi in Katsugeki. Meaningful Name: The name ' Mikazuki ', translating to crescent moon in English is derived from the tempered crescent shaped patterns on his blade. Because of this, he is strongly associated with the symbol ( Most often in the form of a double crescent ), as it is often displayed on his clothing, merchandise for the character and etc. Mellow Fellow: Really notable for how calm and carefree he is most of the time, which leads to Casual Danger Dialogue during battles. New Job as the Plot Demands: In the official High School A.U. manga, Mikazuki alternates between being a student, a teacher, and the school's principal depending on the chapter. Older Than They Look: He comes from the Heian period. There's a reason he (and the whole fandom) calls himself Jiji/Gramps. Odd Friendship: In the adaptations often with Tsurumaru Kuninaga and Yamanbagiri Kunihiro. Perpetual Smiler: Rarely, if ever, seen without a smile on his face. Crosses over to Stepford Smiler depending on the adaptation. Rare Random Drop: A sword with the highest rarity (5 sakura petals) in game, and for a while he was the only sword in the game to have that rarity until Juzumaru came along. "The admiral is in the base... Hahaha, as expected, that is not quite right, is it?" 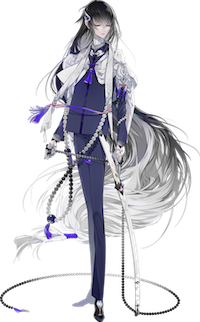 Series Mascot: Is the face of the franchise outside of the Anime adaptations note though for quite a while, he was the face of Katsugeki/Touken Ranbu before the reveal of the primary protagonists. It helps that due to his design, he is incredibly recognisable even being called iconic character by Word of God. Sword Beam: In Katsugeki, Mikazuki's sword produces golden crescent shaped beams with every slash. It becomes a double crescent, resembling his crest, when he executes his Finishing Move. Tareme Eyes: In Touken Ranbu - Hanamaru, his eyes are notably drawn to be a bit droopier when he's relaxing around the Citadel, possibly to mirror his carefree mannerisms. They become sharper when he's in a serious mood. Those Two Guys: While a lot of the swords are paired off in Hanamaru, hes prominently seen with Kogitunemaru when hes not interacting with other swords. "Well, for both people and katanas, the bigger the better. Is that not so?" Well-Intentioned Extremist: Is depicted this way in The Musical and eventually the Stage Play once The Reveal came along. You Gotta Have Blue Hair: He has short dark navy hair with a pale gray gradient on his bangs. "Although I might be big, my name is Kogitsunemaru. No, I'm not joking. I'm certainly not a fake, either. I'm small! Even though I'm big!" A sword forged by Sanjou Munechika, Kogitsunemaru is a slightly vain man with a strong affinity with foxes (made obvious by his name). This is because according to the legend, a kitsune in the guise of an apprentice appeared to help the master smith to forge a holy blade, and Kogitsunemaru was born. Animal Motifs: Foxes, even more so than Nakigitsune; his hair is shaped like fox ears and he regularly talks about brushing his fur/tail (despite not having either of those). Anime Hair: Not as extreme as most examples, but parts of his hair do stick up to resemble fox ears. Beware the Nice Ones: His lines to the Saniwa are very playful and polite, but once he gets injured or awakens, he shows a much more violent and wild side. Cloud Cuckoo Landers Minder: Is this to Mikazuki in The Musical, to a degree. Ironic Name: He often points out that even though his name means "little fox", he himself isn't exactly little. Keigo: He uses polite speech most of the time. Rare Random Drop: Despite having a 3 petal rarity, he is one of the more difficult swords to get because he only drops in one boss node, and has the same elusive four hour timer as Mikazuki. Trademark Favorite Food: He seems to be fond of fried tofu, which ties into his fox motif since fried tofu is the favorite food of kitsune according to Japanese folklore. During internal affairs, he'll ask if they're growing beans for fried tofu, and one of the lines from his special Nendoroid background also has him mention it. Kogitsunemaru: If I've become like this, then I can eat a big piece of fried tofu. Those Two Guys: In Hanamaru, is often paired off with Mikazuki Munechika when hes not interacting with other swords. "I am Ichigo Hitofuri. I am the only tachi crafted by Awataguchi Yoshimitsu. The Toushirous are my younger brothers." The only Tachi forged by Awataguchi Yoshimitsu, so he is the older brother of all the "Toushirou"s. A polite and humble young man who's shown to be concerned with his little brother's well-being. Affectionate Nickname: His younger tantou brothers call him "Ichi-nii". Big Brother Instinct: He often asks the Saniwa to take care of his younger brothers when he can't do so himself, clearly showing that he cares a lot about them all. "I will be going. While I am not around, please take care of my brothers." Big Brother Mentor: In his sparring interactions with the other Awataguchi swords, he acts like a patient teacher (Hakata even refers to sparring sessions with him as "the Ichi-nii Check"). It's also apparent in his line when you choose him to be the captain of the team. "It's the same thing as leading my brothers." Green-Eyed Monster: Not an extreme case, but he seems to be displeased about the Saniwa having lots of swords in the citadel. His previous master, Hideyoshi was a connoisseur collector of swords and it was a symbol of his power to be able to attract many followers who make gifts of swords for the sake of winning his favour. Word of God says that he actually does mind the growing collection of swords that compete with his for the love of the Saniwa. Somewhat Hilarious in Hindsight because a great number of the new additions are Toushirous. "Collecting swords...? No, I have no complaints about it." Hidden Depths: According to Word of God he has issues about his Loss of Identity and Hates Being Alone, but because he's too nice he says nothing about it. Humble Hero: Shown to be quite humble, akin to Haruna. He even thanks you when he gets MVP. Keigo: His speech is peppered with this, making him very polite. Loss of Identity: Since his former master, Lord Toyotomi Hideyoshi wasn't tall, Ichigo was adjusted to his current form. Word of God says that he has a fear of drifting away from his past identity where the heights of his glory and bond with his previous master Yoshimitsu lie. "As I grow stronger, I feel like Im becoming a different person from my past self...No, although I wonder if its a good thing." Massive Numbered Siblings: The majority of the tantous (and two of the wakizashis) are his younger brothers. Meaningful Name: Hitofuri means "one blade" and Ichigo can be translated as "once in a lifetime". My Master, Right or Wrong: Ichigo would carry the Saniwa's orders no matter what he's ordered to do. He's also reminding his younger brothers to obey and have faith in the Saniwa's motives. (to Namazuo, in their Osaka Castle recollection) "Let's believe. In our current master." (if his brothers undergo Kiwame training) "To match the master is in a sword's nature." Princely Young Man: He even wears a cape. Rare Random Drop: As a special rarity sword (four sakura petals). Easier to obtain than, say, Mikazuki Munechika, but saniwas, especially the new ones, most likely won't be seeing him unless they get lucky on smithing. Stepford Smiler: According to Word of God, he tries his best to act mature for the sake of his younger brothers and the Saniwa. Uniqueness Value: Being the only tachi crafted by his forger, it's fitting that Ichigo's rarity in-game is Special. Why Did It Have to Be Snakes? : Why Did It Have To Be Fire? Being burnt in the Osaka Fires was very traumatizing for him. If he's destroyed, he has an Heroic BSoD about it. "Aah... the world is burning... I'm returning, into those flames..."
You Gotta Have Blue Hair: The only Awataguchi sword with light blue hair, which many have assumed to be a reference to Osaka Castle's roof. "I am Kobizen's Uguisumaru. I don't really know where my name came from, but, well, please take care of me." A Heian-era tachi. It is said that he is named after the warbler because the sound he makes when being unsheathed is as clear as bird song. Animal Motifs: Associated with the warbler. Specifically, the Japanese brush warbler, known in Japan as "uguisu". In Touken Ranbu - Hanamaru, he can even perfectly imitate its call. Cloudcuckoolander: Apparently, he feeds the horses in the citadel with rice balls. Deadpan Snarker: He showed hints of this in Hanamaru (especially the dub) toward Hasebe, calling him the Saniwa's pet. He's even more snarky towards Ookanehira in their interactions. Foreshadowing: His citadel line about wishing that people wouldn't care so much about what others think of them was actually, among the many references by name, to Ookanehira and his complex about the Tenka Goken. Hidden Depths: He hints that people should cherish their lives and not waste them over trivial things like battles or conflicts. His sword, while very old, was initially forged with severe defects; it was considered almost a miracle that he lasted for centuries without breaking until he was repaired much later. Last Request: His line if he's destroyed. "On my death anniversary... please offer some tea." Older Than They Look: Just like Mikazuki Munechika, he's from the middle Heian period. Rare Random Drop: One of the rare four petaled tachi that can only appear in the later stages, if not for a lucky smith. Reluctant Warrior: Has shades of this, though nowhere near Kousetsu's extent. Uguisumaru's lines in battle imply that he would much rather be somewhere else, likely drinking tea, instead of fighting. He even goes near the Thou Shalt Not Kill territory in some of them, outright saying he does not like to kill, telling the enemy to value their lives, and in his Awakening line he says it would be better if the opponent escapes. Stalker Without a Crush: In Zoku, he has a habit of following Ookanehira around and write down in his observation journal about his daily routine without him noticing. Trademark Favorite Food: Trademark Favorite Drink — loves to drink green tea. "I'm Shokudaikiri Mitsutada. I can even cut through a bronze candlestick holder... Yeah, that's really not cool at all." A tachi who was wielded by Date Masamune. He's very concerned with how "cool" he looks at any given time, but otherwise pleasant. Affectionate Nickname: Taikogane calls him "Micchan"; Tsurumaru calls him "Mitsu-bou". Badass in a Nice Suit: He wears a suit and necktie into battle. The official artbook even reveals that under his tailcoat, he wears another Waistcoat of Style. Embarrassing First Name: Shokudaikiri literally means "Candelabra Cutter", which Mitsutada isn't that happy about. Eyepatch of Power: A homage to the fact that the real life Date Masamune only had one eye. Hidden Depths: Behind the vain streak, the World 7 recollections reveal he's a thoughtful individual who enjoys having a human body because it allows him to be helpful to others. Horned Hairdo: His cowlicks create this effect. Mighty Glacier: He's one of the slowest tachi swords, but he had the highest attack stat out of the entire group upon the game's release. Currently he is tied for the second-highest. Mysterious Past: The fanbase loves to expand on his past, because he never mentions that he was destroyed, and is awfully chipper despite the negative things that has happened to him. Nice Guy: The reason he wants to cook a meal good enough to ease up the tension between Ookurikara and Kasen? He does it because Sayo confides to him that he was troubled by their hostility. The Nicknamer: Calls Ookurikara "Kara-chan", Tsurumaru "Tsuru-san", and Taikogane Sadamune "Sada-chan". Real Men Cook: Will offer to cook for you in his CG after he finishes fieldwork in internal affairs. Also in a Recollection with Sayo, Mitsutada mentions that the best thing about having a human body is that he's able to cook. Red Oni, Blue Oni: Color-inverted with Ookurikara. Despite being the one with dark blue color theme he is the talkative and cheerful one of the two. Rule of Cool: Actively tries to invoke this, though constantly mentioning his own desire to be cool may result in the opposite effect. Tall, Dark, and Handsome: Notably, regarding the "dark" part, that he wears black from head to toe, is a homage to the fact that the actual blade has been burnt into nearly completely black. Team Chef: He's often the one who cooks for other characters. This is a reference to how Date Masamune liked to cook in real life. Team Mom: Sayo even lampshades how Mitsutada is the person who keeps the Date clan swords together. During a series of recollections, he acts as a parental figure to both Sayo and Taikogane. ¡Three Amigos! : With Tsurumaru Kuninaga and Ookurikara, along with Taikogane Sadamune acting as the Tagalong Kid of the group. "I am called Kousetsu Samonji. Is there a day when fighting disappears from the world?" A tachi from the Samonji school, Kousetsu is a calm but pessimistic man who disdains fighting. He is named after his first owner Itabeoka Kousetsusai, who was a pacifist and a devout Buddhist, hence his manner of dress and dislike of violence. The Eeyore: He frequently says that the world of is full of sorrow. Badass Pacifist: Believe it or not, he's one of the strongest Tachis after reaching Toku. Hime Cut: A male version. He has even bangs on either side of his face and long back hair. Fittingly, his personality also shows shades of Yamato Nadeshiko. Irony: Despite his hatred of conflict, the manga anthologies like to poke fun at his talent at making high-quality troops. Furthermore, he has one of the highest stat distributions in the entire game and his rarity allows him three slots for equipment, making him quite good in battle. Martial Pacifist: Influenced by his master, who was a monk, Kousetsu prefers to solve things without violence, but will fight when necessary. Rare Random Drop: Is one of the four-petal tachis, along with Ichigo, Tsurumaru, and Uguisumaru. Reluctant Warrior: Really doesn't like fighting. Snow Means Death: He's often associated with ice and snow thanks to his appearance and name meaning "snowy bay". This trope is in play because his injured sprites resemble blood drops on snow. Sugar-and-Ice Personality: Normally cool and cynical due to his dissatisfaction with the necessary violence they must partake in, Word of God says he cares a lot about his younger brothers. "Kakakakaka! This humble servant of Buddha is called Yamabushi Kunihiro! Everyday, this person is always in the ascetic practice!" A tachi from the Kunihiro school, he is an enthusiastic and boisterous man who is nonetheless a very devout Buddhist. Ascended Extra: While he has a few notable interactions in adaptations, he gets a rather well received supporting role in the stage play, playing mentor and father figure to Yamanbagiri. Cool Big Bro: To the other Kunihiro swords, and especially to Yamanbagiri in the stage play series. Hidden Depths: In his recollection with Juzumaru, he's shown to be very open-minded of other's faiths and goals behind his eccentricity, to the point where he seems like a fully-realized Buddhist monk. Meaningful Name: The Yamabushi are a group of ascetic monks who practice Shugendo Buddhism, hence why Yamabushi himself is such a devout Buddhist. No Indoor Voice: His voice is rather loud and booming, especially if he's the one who speaks while the game loads. Sibling Yin-Yang: With Yamanbagiri. Yamabushi is enthusiastic and optimistic, while Yamanbagiri is more reserved and pessimistic due to his issues. Signature Laugh: His is a rather distinctive KA KA KA KA! Third-Person Person: Despite his loud and boisterous personality, he almost constantly refers to himself as "this humble servant of Buddha". Warrior Monk: He is very dedicated to his faith and spiritual training. Unlike Kousetsu, he's much more enthusiastic about fighting. "Roar, the muscle of the Buddha's servant!" "The name's Shishiou. My black lacquered tachi is cool too, right!? I'll be super active, so use me a lot, okay? Heheh." According to legend, Shishiou was gifted by the Emperor to the famed archer Minamoto no Yorimasa as a reward for killing a nue that had been haunting the imperial residence. He is very attached to his former owner, and will mistakenly address the Saniwa as "old man". Animal Motifs: Associated with lions, since that's essentially what his name means. It gets to the point where if you leave him alone as you secretary for a few minutes, he'll mutter a bored sounding "Gao~". Fashionable Asymmetry: There's quite a bit of this going on with him. In his regular outfit, he wears a different kind of glove on each hand and one leg of his pants is shorter than the other, and in his internal affairs outfit he seems to have rolled up one leg of his pants just to keep the effect. Freudian Slip: Since he was so attached to his former owner, who was an old man, he'll sometimes address the Saniwa as "old man" by mistake. Height Angst: According to Word of God, he's conscious about his height. Nemean Skinning: He wears the skin of a dead nue over his shoulder, since according to legend, his real-life owner killed one. However, his damaged portrait implies that the nue might still be alive. Nice Guy: Word of God describes him as being kind and having a strong sense of justice. "Yo. I'm Tsurumaru Kuninaga. Are you surprised that somebody like me came here so suddenly?" A tachi made in the Heian period by a student of the blacksmith who crafted Mikazuki Munechika. Due to being removed from his resting place so many times, he has a love for surprises. Affectionate Nickname: Shokudaikiri calls him "Tsuru-san". Animal Motifs: Cranes. He has the kanji for "crane" in his name, and he regularly mentions how similar he looks to a crane thanks to his all white clothing. Back-to-Back Badasses: Most prominently with Mikazuki Munechika in several of the adaptations. Boisterous Bruiser: Portrayed as this in Katsugeki. Does Not Like Spam: Send him out to do fieldwork with Mitsutada, and he reveals that he can't stand vegetables, particularly their smell. Fans theorize that it may have to with the scent of fresh earth, like when he was stolen from his owner's grave. Iconic Item: In Hanamaru, his COOL sunglasses. Have since become Defictionalized and sold as both the original sunglasses and as a necklace due to their memetic nature. Irony: Cranes are believed to give their owners longevity, but Tsurumaru didn't. Instead, most people that owned him died not long after they acquired him. Tsurumaru himself, however, does have longevity, as he was created in the Heian era and has remained intact until now. Manchild: In contrast to Mikazuki Munechika who acts like a calm old man, Tsurumaru occasionally gives off the air of an exuberant teenager, if not a fairly sociable young adult depending on the adaptation. This is often flanderized by the fandom and occasionally the writers when they play up his more childish tendencies. Man in White: Up to Eleven. Not only are the majority of his clothes white, but his hair is also silverish white and his human form skin tone is the palest among the swords. Even more so after he drops the black leg guards in his casual clothes . The Nicknamer: He calls Shokudaikiri "Mitsu-bou" and Ookurikara "Kara-bou". Older Than They Look: He's from the same time period as Mikazuki. Perpetual Smiler: Rarely, if ever, seen without a smile on his face. Slasher Smile: In Katsugeki, he is portrayed as a rather bloodthirsty warrior since he seems to enjoy killing the Retrograde army and prolonging their suffering during battle. Skewed Priorities: In his line if he's destroyed, he seems to be more worried about his clothes than himself. "What a bummer...with these robes dyed completely in red...I don't resemble a crane anymore." Sword Beam: In Katsugeki episode 13, Tsurumaru's takes the form of a wing, going along with his crane motif. The Trickster: Loves to surprise people. ¡Three Amigos! : With Shokudaikiri Mitsutada and Ookurikara, along with Taikogane Sadamune acting as the Tagalong Kid of the group. 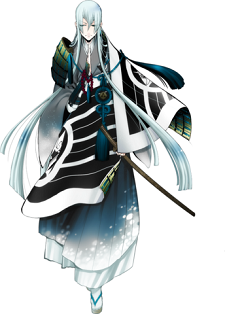 Vocal Dissonance: Tsurumaru, who is a very pretty teenager looking man with rather large eyes, has a rather deep voice that is a bit weird to hear, although it's not bad as Yagen Toushirou. "Hello, excuse me. I'm known as Akashi Kuniyuki. Nice to meet you. Well, go easy on me, alright?" An extremely lazy tachi from the Rai school who makes it clear how unmotivated he is about anything. Deadpan Snarker: His Lazy Bum tendencies help making his lines quite directly snarkier than the other swords'. For example, his line when he's injured and idle in the Citadelquote "Leaving me like this without even giving me treatment... and here I thought that not wanting to do anything was supposed to be my specialty." or when he's sent to do fieldworkquote "Ideally, I'd like to specialize in eating, but...". Hypocritical Humor: One of his Citadel lines which references his protegees Hotarumaru and Aizen can easily be seen as this. He asks you to take good care of them, after all... he is their guardian. Kansai Regional Accent: Speaks this way, and is the only character to do so thus far. Lazy Bum: He freely admits that he never feels like doing anything. He says it's part of his character. Lightning Bruiser: The tachis are this when compared to the oodachis, but Akashi stands out, despite his lazy personality, as he is the sword with highest mobility before toku with basic mobility of 43, and after toku, he is as fast as Sayo with mobility of 49. Parental Favoritism: Though not actually a parent, he is Hotarumaru and Aizen's guardian, and blatantly favors Hotarumaru. Their smiths were father and son, hence the relationship with Aizen and Hotarumaru. Pet the Dog: In Hanamaru, despite his lazy attitude, he helps an injured mother tanuki get her leg out of a bear trap, and he gets along with her cubs very well. He even takes the blame for them destroying the crops and gives them some medicine and food while taking care of them. Sorry That I'm Dying: His line when he's destroyed is an apology to his favorite protege, Hotarumaru. "Sorry, Hotarumaru... it doesn't look like I'll be coming... home..."
"I'm a treasure of the Minamoto clan, Higekiri. Are you fine with being my master in the present age?" 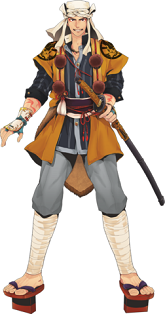 A tachi who once belonged to the Minamoto clan, Higekiri is laid-back and somewhat forgetful due to the long life he's lived. Unlike his brother, he's less attached to the notion of representing the clan as their treasure, feeling those things don't matter in the present day. Aloof Big Brother: Towards Hizamaru, to the point where he can't even remember Hizamaru's name, though this may be justified since they've both gone by so many different names over the years. Downplayed though in that he still asks the Saniwa to take care of his little brother, regardless if he has forgotten his name. Beware the Silly Ones: Like Mikazuki, he references his long life as a sword and has an almost childish personality. However, he is also very casual about the fact he's a sword whose names are backed by legends of demon-killing in battle. At Toku San, he has the highest Impulse (affects critical hit rate) and Killing Blow (affects the chance of Awakening) stats out of the tachis. Cloudcuckoolander: His odd sense of priorities, or lack of them in some cases, causes worry for his brother. Coat Cape: He has a habit of wearing his jacket on his shoulders, whether in his normal outfit or his internal affairs outfit. Cute Little Fangs: Like his brother Hizamaru, he has them too. He has trouble with remembering names, whether it's one of the many names he's been known by or his own brother Hizamaru's name. In the manga anthology SQEX Formation, he can only remember other characters' names through mnemonics; Higekiri is able to remember Horikawa's name because he bought him sweets, and he is finally able to remember Hizamaru's name because "hiza" means knee. Downplayed somewhat in Katsugeki where Higekiri does call Hizamaru by name and only jokingly gets it wrong in a teasing manner. I Have Many Names: "Higekiri" is only one of the names he's been known by throughout history, and he makes various references to these other names (even if he can't exactly remember what those names are). Some of these include "Sun-Nashi" (Missing Sunnote "Sun" here refers to an ancient Japanese unit of measurement), "Tomokiri" (the Friend Slayer, or Equal Cutter), "Shishinoko" (Lion's Cub) and "Onikirimaru" (Demon Slayer). Perpetual Smiler: In contrast to Hizamaru, which adds to his more carefree attitude. A Rare Sentence: Hangs a lampshade on being an Animate Inanimate Object when he's sent out to do fieldwork. He also suggests that if he becomes an expert at it, maybe his name should be changed to "Zassougiri" (Weed Cutter). "Ahahaha, I've been a sword for a thousand years but...This is the first time I'm doing fieldwork." Those Two Guys: He and his brother, Hizamaru are never seen apart in both anime adaptions. Vocal Dissonance: His voice is somewhat high, making him sound more like a young teenager than an adult. "I am a treasure of the Minamoto Clan, Hizamaru. Has my brother arrived here yet?" Another tachi owned by the Minamoto clan, Hizamaru greatly looks up to his brother Higekiri despite the former barely acknowledging him. He's serious and cares about the clan's reputation, wanting to represent them as a faithful sword. Big Brother Worship: He greatly admires Higekiri, with most of his lines being about his "anija" in some way, and he constantly strives to gain Higekiri's approval. Unfortunately for him, Higekiri doesn't quite return those feelings. This is based off Yoshitsune's admiration for his elder brother Yoritomo, who was one of his owners. Cloudcuckoolander's Minder: Has shades of this towards Higekiri, between asking the saniwa if his brother isn't being a bother and expressing reluctance at leaving his brother behind at the citadel, implying that Higekiri probably isn't aware of important events or dates, and chiding Higekiri for giving out New Year's money to every single person they meet. "I can't afford letting my loss affect my elder brother's honor!" I Have Many Names: Like Higekiri, "Hizamaru" is only one of the names he's been called throughout history and he regularly makes references to those other names. These include "Makuragami" (On the Cushion), "Kumokirimaru" (Spider Slasher), "Hoemaru" (Howler) and "Usumidori" (Light Green). Not So Stoic: Discussed when sent to spar with Iwatooshi. He tries to intimidate Iwatooshi and taunts him, but later loses composure and feels ashamed for being immature. Iwatooshi surprisingly reassures him it's fine, as immaturity shows he still has a heart. 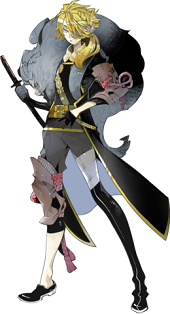 Perpetual Frowner: In contrast to Higekiri, which adds to his more straight-laced demeanor. Averted in Katsugeki where he's shown to have a more sunny disposition, particularly when interacting with Higekiri. Sibling Yin-Yang: One of the most obvious cases in a game that already has a few instances of this trope, as reflected in their opposite personalities, stats, and appearances. "Elder brother... Once again, we will be separated..."
Those Two Guys: He and his brother, Higekiri are never seen apart in both anime adaptions. You Gotta Have Blue Hair: His hair is green, which is likely a reference to how one of his many names was Usumidori, which means "light green". "I am Juzumaru Tsunetsugu. Through the long years, as people's values have changed again and again, I have fixed my gaze on the true meaning of Buddhism." One of the Five Great Swords of Japan and formerly owned by the great Buddhist reformer Nichiren . Eyes Always Shut: His eyes are always closed; none of his in-game art shows him opening them, not even when he's damaged. Hair Decorations: A jeweled barrette that encircles his head, almost like a halo. Keigo: He speaks polite language at all times. Meaningful Name: His name comes from the term for Buddhist prayer beads or juzu. It is said that when Nichiren received the tachi, he hung his prayer beads on it. Rare Random Drop: Alongside Mikazuki and Oodenta, he bears the distinction of having an extremely high five-petal rarity, making him one of the rarest swords in the game. Rapunzel Hair: Currently holds the place as having the longest hair in the game with it longer than he is tall. "...A tool that cuts down people is protecting the way of the Buddha. I wonder if this state of affairs is a mistaken one..."
"...I am one of the Tenka Goken, Oodenta Mitsuyo. Should you not keep me sealed up?" A Mitsuyo sword and the third of the Five Great Swords to be implemented in the game, Oodenta is the long treasured sword of the Maeda Clan. Most notably used for his ability to ward away illnesses, his spiritual power was said to be so strong it even made birds flying over the house fall dead to the ground. This, combined with being kept under strict lock and key for so long, has made him understandably dark and gloomy. Adaptation Dye-Job: Oodenta's eyes are red in the game and Katsugeki adaption, but changed to red violet in Zoku. Finishing Each Other's Sentences: He and Sohayanotsurugi do this in their recollection. Oodenta Mitsuyo: "The spiritual defense of the shogunate..."
Irony: His powers are capable of killing just as easily as healing. Power Incontinence: He's aware of just how dangerous he can be. He even demonstrates it in his awakening sprite with a divine aura trailing from his blade. In terms of stats, he has the strongest attacking stat at Toku. "You don't seem to understand the reason why I've been sealed!" Rare Random Drop: Like the other Five Great Swords, he has a high five-petal rarity. Red Eyes, Take Warning: Dangerous to just be around, and his dull red eyes reflect that. In Katsugeki, his eyes glow bright red when he is ready to unleash his true strength. Scare the Dog: Animals tend to be afraid of his spiritual power, so he's reluctant to even go near the citadel's horses. One episode of Hanamaru focuses on the other swords helping him get used to animals, and in turn helping the animals get used to him. Self-Deprecation: Constantly remarks about how he's not good for much else besides curing disease. Slasher Smile: In Katsugeki, he makes a very intense and dreadful one when he's ready to eliminate his enemies in battle. Super Strength: In Katsugeki, He grabs a Retrograde mook by the neck and throws him hard to the ground, killing him instantly. "Soyahanotsurugi Utsusunari.... I'm a copy of Sakanoue's treasured blade. Let's get along." A protective sword of Tokugawa Ieyasu, he was initially buried with his master in order to grant him spiritual powers. As with Oodenta, he was forged by Miiketenta Mitsuyo. Cloning Blues: Downplayed when compared to Yamanbagiri, as he believes it doesn't matter whether one starts out as a copy or not. He does tend to blame his shortcomings on the fact, however. 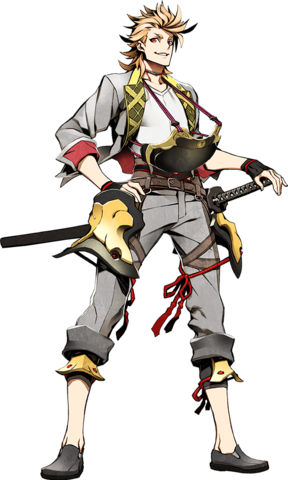 Historical In-Joke: His very loosely-hanging breastplate is a reference to how Tokugawa Ieyasu also wore an ill-fitting breastplate. Overly Long Name: Try saying that five times fast. Points for it being written in a long katakana form, rather than kanji. The Resenter: According to a recollection with Monoyoshi, he doesn't think very fondly of their previous master Ieyasu, referring to him by one of his less flattering nicknames. Sibling Yin-Yang: Contrast him with Oodenta, and it's night and day. "My name is Kogarasumaru. To battle foreign foes is my destiny. Even after a thousand years, that will not change." A sword that was said to be the base of all traditional Japanese blades (nihonto). For this reason, he calls himself the father of all swords, because technically, he is. He was created by Amakuni Yasutsuna in the 8th century. Animal Motifs: Crows. His name literally means "little crow" and he wears crow feathers in his hair. Anime Hair: His hair somehow resembles a pair of wings. Facial Markings: He has two black dots on his face, one below each eye, but it isn't clear if these are Beauty Marks or just part of his makeup. Fashionable Asymmetry: One of his sleeves is much longer and wider than the other. The Gadfly: In one recollection, he has fun messing with Shishiou. The Fatalist: Strongly believes he is led by fate. Hair Decorations: He wears two crow feathers in his hair, in keeping with his crow motif. Older Than They Look: He looks as young as the tantous, yet he is the oldest nihonto to ever exist, even older than Mikazuki or Ishikirimaru. It's lampshaded during his introduction in Hanamaru, when Shishiou tries to pet his head as though he were a kid and Kogarasumaru shrugs him off, telling him that he shouldn't judge by appearances. "I'm Ookanehira. Discovered by Ikeda Terumasa, a blade of elegant craftsmanship. Among the most beautiful swords that exist, and yet..."
A tachi forged by the smith Kanehira from the Kobizen school. While he is considered one of the grand champions of all swords, he has a rivalry with Doujigiri Yasutsuna, one of the Tenka Goken. Historical anecdotes and legends about Ookanehira are rather scarce, but one core foundation of this blade is the theory that it was noticed by Ikeda Terumasa. Hes being watched over by Uguisumaru, who comes from the same province. Arrogant Kung-Fu Guy: He's crude to the Tenka Goken and Kogarasumaru (barring Juzumaru) during spars, but ends up getting his rear handed to him. Big Ego, Hidden Depths: While he's surly and arrogant, he does work hard for the citadel and enjoys doing Internal Affairs tasks without complaint or snark in spite of his pride. Fashionable Asymmetry: He wears half of a jacket/arm guard combination on his left arm, while his right arm has a glove and shoulder guard. Fiery Redhead: Has dark red hair and quite the temper. Gray Eyes: He has gray eyes, probably to contrast the more exotic eye colors or styles of the Tenka Goken. Horrible Judge of Character: Inverted. Ookanehira is quick to assume the Tenka Goken are The Proud Elite and judges them harshly, but the ones currently in the game have milder personalities, with only Mikazuki having a touch of vague condescension in his lines. 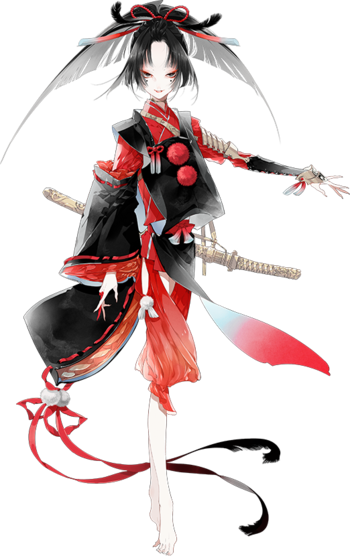 I Just Want to Be Special: He's not considered a Tenka Goken, but believed to be matched in beauty to one of them, Doujigiri. For this reason, he tries to prove himself to be good as, if not better than a Tenka Goken to the Saniwa. Last Request: If he's destroyed. "I hope that I...can die beautifully..."
Older Than They Look: He comes from the same time period as Uguisumaru. Pet the Dog: Of the Tenka Goken swords, he's shocked by Juzumaru's more humble attitude towards him (as he sees it compared to the others) and treats him politely. The Rival: To Doujigiri Yasutsuna. Tsundere: In their recollection, Uguisumaru teases him that he is one for the Saniwa for wanting their attention, to his denial. If left idle, he wonders if his personality drove them away. "I'm Koryuu Kagemitsu. A wandering traveler roaming about in search of a master... I wonder, are you my master this time?" A tachi made by Bizen Osafune smith Kagemitsu. The name comes from the Kurikara dragon engraved on its tang. Some of its many alternative names include 'Kusunoki Kagemitsu' and 'Nozoki Ryuu (peeking dragon) Kagemitsu'. A vagabond forever on a journey in search of his true master. Animal Motifs: Dragons, because his name comes from the Dragon King Kurikara, whose picture is tattooed on his neck. Badass Cape: Wears a black cape that's sky blue on the inside, and he's very much a Badass in a Nice Suit. Badass in a Nice Suit: He wears a suit with a loose lavender necktie into battle. Blood Knight: In one of his awakening quotes. "I'll cut you down...you won't even feel it..."
I Have Many Names: According to him, Koryuu has been given many names, such as Nankou Kagemitsunote (Nankou refers to previous master Kusunoki Masashige), and Nozokiryuu Kagemitsunote ("Nozokiryuu" means Peeking dragon after the engraving on the tang that appears to peek out from the hilt). He doesn't mind being call either one. Hair Decorations: He wears black barrettes on both sides of his hair. Off with His Head! : He intends to decapitate his enemies during battle. "That head of yours, I'm taking it!" "I am Azuki Nagamitsu. Do you... like sweets?" A tachi said to be Uesugi Kenshin's beloved sword. Although there are many versions of how he received his name, he speaks about how his name came about when a red bean got split into two when it hit the blade. A well caring childminder, as well as a sweets craftsman, however he does not suit with his favorite apron. Affectionate Nickname: Kenshin calls him, "Atsuki". Badass Cape: Wears a burgundy cape on his right shoulder and he's very much a Badass in a Nice Suit. Badass in a Nice Suit: He wears a suit and necktie into battle. Fashionable Asymmetry: He wears an armor guard on his right shoulder. Real Men Wear Pink: He enjoys making sweets (especially for children), and he even wears a pink apron as part of his Internal Affairs outfit. Sweet Tooth: He likes eating and making sweets, especially dango. Fitting, since his first name means "red bean" and red beans are often used to make various Japanese sweets. Trademark Favorite Food: Like Kenshin, he takes a particular liking to sanshoku dango, which is also featured as a charm on his person in his official art. "A pleasure to meet you. I am Daihannya Nagamitsu. I am the masterpiece of Nagamitsu, a swordsmith of the Osafune school." His name comes from being worth 600 kan and 600 scrolls of Daihannya scripts when forged during the Muromachi Period. This sword has been owned by many famous historical figures such as Ashikaga Yoshiteru, Oda Nobunaga, and Tokugawa Ieyasu. He loves works of art and speaks of how he believes that flirting with those he deems beautiful to be of utmost importance. However, his usual motto is that of extreme frugality. The Alcoholic: In few of his lines, he appears to be interested in drinking alcohol. "Drinking makes one's wisdom surge." Cultured Warrior: Speaks of enjoying works of art. Fashionable Asymmetry: He wears an armor guard on his left shoulder and a decorative one on his right leg. Spell My Name with an "S": Is it Dai Hannya or Daihannya? The Tease: In some of his dialogues, he has a habit of flirting with or teasing other people. "Hobbies? Let's see... how about to seduce someone like you? Hahaha, did I surprise you?" "Chiyoganemaru. I was born in Yamato, but raised in Ryūkyū. I have been tentatively classed as a tachi, but don't be too bothered about that. I dislike being confined to the boundaries of Japanese katana." Said to be one of the treasured swords from the royal family of the Ryukyu Kingdom. Although the blade is thought to be made in Japan, it's form differs from the conventional Japanese Katana with a unique single hand handle. Should you lend an ear to his voice, which resembles the lapping waves, you will be lulled into Uchina Time. Badass Pacifist: He doesn't like fighting, but that doesn't mean he won't hold back fighting against the Revisionists in order to protect history. Curtains Match the Window:He has matching aqua hair and eyes. Hair Decorations: He wears a golden hair clip on his right side of his hair. Mellow Fellow: His Citadel lines always emphasize taking things slow, and of the current sword he's currently among the most easygoing. Ooh, Me Accent's Slipping: He has a natural Okinawan accent, but he tries to cover it up with modern Tokyo dialect. It slips during one of his Citadel lines. You Gotta Have Blue Hair: He has long aqua hair that matches his eyes and outfit.